Features a secure latch, is acid-free and designed to easily stack and work together. Non-divided interior includes 4 tab sheet dividers and labels perfect for storing paper, fabric and more. All Super Satchel boxes are acid free and are designed to easily stack and work together. 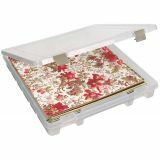 Measures: 15" x 14" x 2"
ArtBin Super Satchel Slim Single Compartment - Use satchel to store fabric yardage, fat quarters, quilt tops and 12x12 inch scrapbooking papers. Features: secure latch and easy grip area. All Super Satchel boxes are acid free and are designed to easily stack and work together. (shown with product not included). Measures: 15Hx14Wx2D inches. Made in USA.